This egomaniac has lost his marbles, by living in his own cloud, he believes that whatever nonsense that comes out of his mouth is a cool joke or radiates wisdom … evo must finish his mandate and then go home! THE PRESIDENT EVO MORALES IN THE DISTRICT OF LAVA LAVA MUNICIPALITY OF SACABA IN COCHABAMBA, SAID TO FEEL “OFFENDED” BECAUSE THEY CALLED HIM “MISTER”. IT WAS YESTERDAY. “It is an absolutely indisputable feature of authoritarianism that the President has to instruct what they should say and what other people should think, it is a trait of authoritarianism and above all to put a teacher to teach. In this case, for all that a teacher represents, I believe that it is an offense to all the Bolivian people who long ago realized that the process of change is pure discourse because it ends up reproducing all the old customs that have been criticized by the old political system,” said Costa. 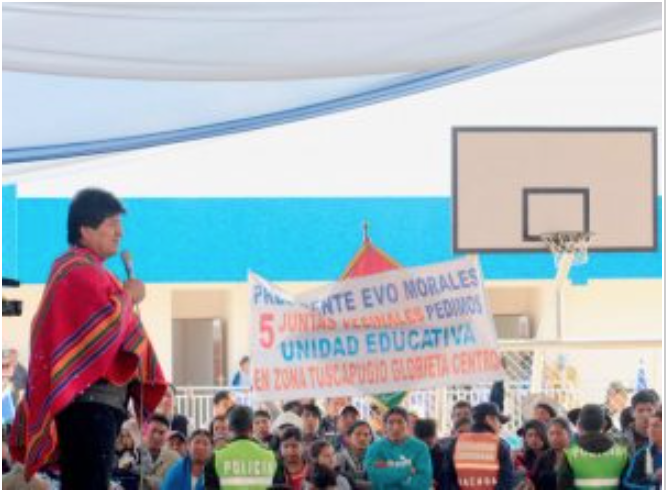 Morales, yesterday participated in an act of delivery of an infrastructure to the educational unit “Plurinacional”, located in the Lava Lava district of Sacaba in Cochabamba. It was there where, in the middle of his speech, he attacked the District Director of Education, stating that said authority had “offended” him because he called him “Mr. Evo Morales, Mr. President”. “Now there is a task, so that it is forgiven. You are going to buy a 100-sheet notebook and there you will write, brother president or fellow president. That way you’ll be forgiven district director. Understood? Approved with applause. Our mayor is going to control,” Morales said. The fact did not go unnoticed in digital media and social networks where many internauts rejected the attitude of the Bolivian President. For Costa, the fact shows that the president who governs Bolivia the most years lost the identity with which he began to govern in the country more than 12 years ago. “I believe that he has spent so many years in power that he has completely lost not only the compass but the identity. The coca grower leader in all these exorcist and other worries ends up having a profile as authoritarian as the military governments that we have had in the republican history,” said Costa. In this line, the deputy of National Unity, said that the only way to change this situation is for the Movement to Socialism (MAS) and President Evo Morales not to return to power. “What can be done? Change Government through the institutional way because as Democrats there is no other way than indicated in the Constitution and in this particular case that we know is a disqualified candidate by the Constitution, the imposition of his candidacy is a blow to the Constitution. So, what the Bolivian people should do is change their government,” she said. This entry was posted in Bolivia, Politics, Social Unrest and tagged bad politics, corruption in public office, demagogue, democracy in peril. Bookmark the permalink.